We say Deus Charitas Est not just to provide another name for the sake of another name for That Which has an infinite number of names, but because it is, in fact, the truth. A truth which, provided we seek it, we shall find. Now I like Camaros, even these throwback versions, and while to describe one I can come up with any number of descriptors (not, however, an infinite number): awesum, badass, bee’s knees, bitchin’ … I would not have come up with “classy”. 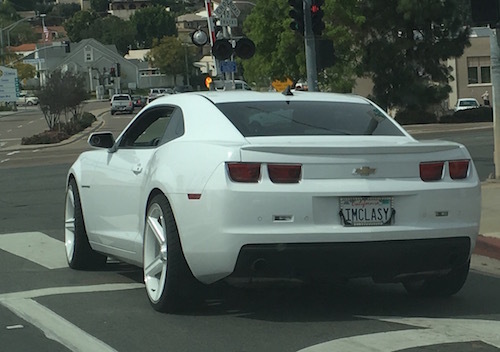 Nor can I imagine anybody so lacking in awareness that he or she would use the word “classy”. And I am really unable to imagine that he or she is so, so lacking in awareness that in wishing to claim it for themselves would use the first person pronoun to do so. So let us be charitable and assume that the owner of that Camaro knows all this, and is in fact being _ironic_. But then I look again and see that it is white. Rufus will blame Trump. And for all I know, he is right to do so. I was looking up the word online – I coulda swore it had some sort of cardiological tie-in. Like angioplasty or some such… But what do I know?